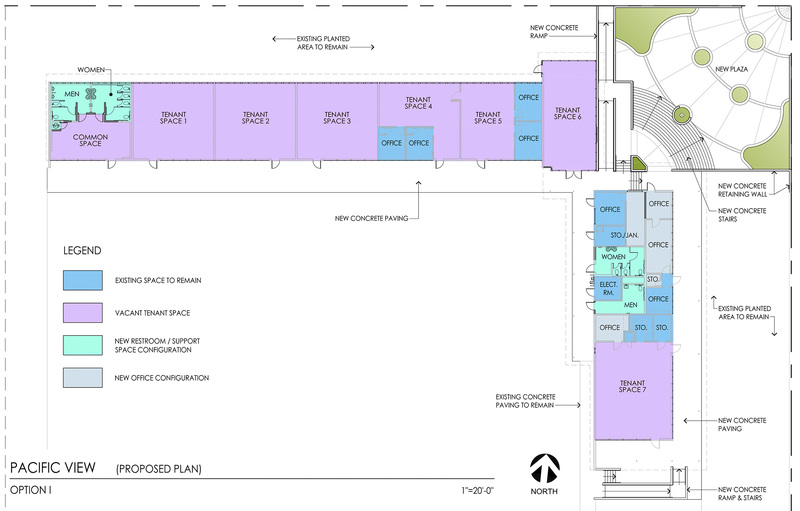 The transformation of Pacific View into a community arts center took two significant steps forward during a relatively brief 55-minute Activation Subcommittee meeting at City Hall on Monday, June 29. About 35 people were in attendance as the first preliminary architectural plans for the site were revealed and the potential schedule for choosing an organization to operate the facility was outlined. Subcommittee members Tony Kranz and Lisa Shaffer were joined by city staff members and Frisco White from the architectural firm of Westberg+White. In the audience were nearby residents, members of organizations interested in administering the site, and other interested parties. The preliminary design ideas were presented by White to elicit input from the community and potential operating partners before his final Rehabilitation and Reuse Study is ready for the city council on August 9. White took note of the audience’s comments and ideas and promised to incorporate the suggestions in the final submission. 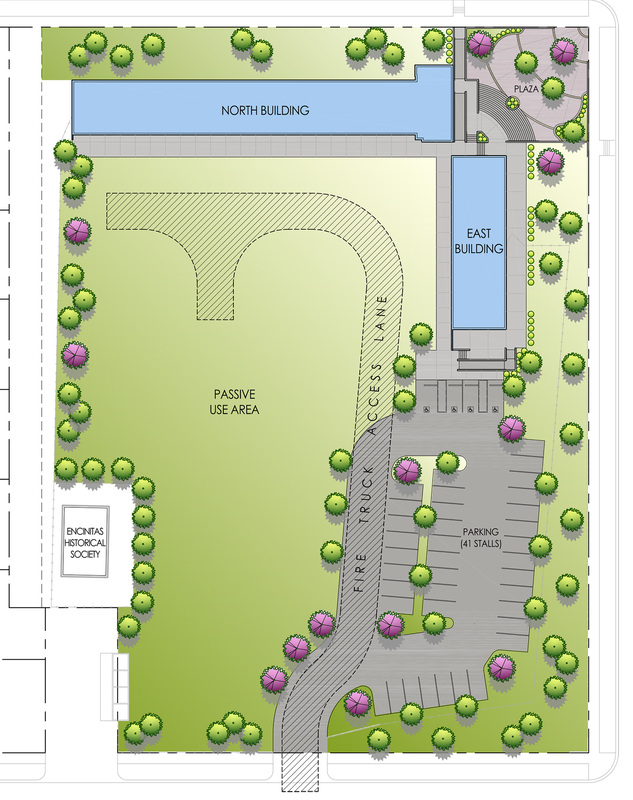 Although the initial design concepts differed somewhat from what some potential operating partners had envisioned, it was a refreshing relief to see the first renderings of open community space and artistic and educational areas at Pacific View — especially in contrast to architectural plans for the site over the past decade that obliterated the former school buildings in favor of new condos and commercial buildings. Twice during the meeting, the audience erupted into applause, indicating their appreciation of how the Pacific View project is being managed. On the topic of selecting an operating partner, Kranz and Shaffer proposed that the city release a solicitation for letters of intent from potential operators on or about July 10. The solicitation would be followed by a “collaboration workshop” around July 20 that Shaffer jokingly compared to speed dating — an opportunity for potential participants to match their interests and goals with others, as well as interact with possible site tenants. The letters of intent would be due around July 31. Shaffer said that the city would prefer that the operating partner be responsible for all subsequent costs for Pacific View, given that the city has already contributed $10 million plus interest to purchase the historical property. Encinitas would probably not ask the operating partner to reimburse those purchase costs, she added. An informal survey of audience members by SavePacificView.org indicated that interest in becoming the Pacific View Operating Partner is substantial, the contenders are relatively happy with the direction of the process, and there appears to be significant cooperation among contending groups and individuals in support of reaching the ultimate goal of a community arts center. Shaffer mentioned that she and Mayor Kristin Gaspar had met with the San Diego Foundation that morning, and that organization was very interested in helping to facilitate the development of the arts center at Pacific View. Encinitas Historical Society President Carolyn Cope explained to the architect and subcommittee that the society wants the Old Schoolhouse to be a central component of the new center, as opposed to being somewhat marginalized as it is today. Nearby property owner Don McPherson and his attorney Felix Tinkov told the subcommittee their concerns about potential excess noise caused by outdoor activities on the site. Councilmember Shaffer assured them that their letter outlining the issue would be taken into consideration by city planners. The complete preliminary architectural report can be found here and the suggested operating partner selection details are here. The city council will make the final decision on the process after a presentation from Kranz and Shaffer. An Encinitas Advocate article about the subcommittee meeting can be read here. Several interior photos of Pacific View’s buildings can be found here. What are your Pacific View thoughts? Click here to Share Your View! The creation of Pacific View’s future is happening now– crucial decisions are being made every month. You and your friends are invited to have your say and Share Your View on the SavePacificView.org website. You can login there directly or use your Facebook, Twitter or Google+ ID to post and comment. Your input is much appreciated, and essential to helping shape a place that can be enjoyed for generations to come.